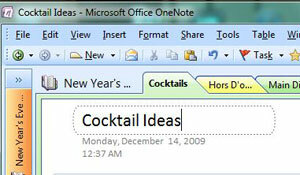 Microsoft One Note may be one of the most useful Microsoft Office applications, yet relatively few people are familiar with it. OneNote's specialty is pulling together various type of information—notes, pictures, documents, videos and web information—into almost any type of project or group you can think of. I like to use it as a virtual recipe box, where I can type in the recipes my mother gave me on little index cards, as well as pull in my favorite recipes from Epicurious or the Food Network. It's great for planning that upcoming New Year's eve party, too! 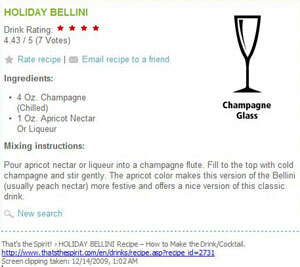 At the top of your workbook, name the tabs different categories of recipes, such as "main dishes," "desserts," or "cocktails"
When your friend wants the recipe for that fabulous champagne cocktail you served, simply put the word "champagne" into the search function at the top right hand corner of your notebook and OneNote lists all your recipes that have champagne in it. Microsoft OneNote comes standard with Office Home & Student Edition or can be purchased separately. OneNote 2007 retails for $99.95, but you can currently find it at Walmart for less than $60. Or download a 60-day free trial from Microsoft and give it a try before you buy..
Had this software on my computer, didn’t know what it was about. Demonstration, clear & concise and enough information to get started using it. Thank you so much for the tip.